Times are bad for the MSM. They’re losing money. They’re imposing layoffs. They’re trying to launch blogs (gasp). And now they’re finding reporters in the most unusual of places. Like, for example, the activist core of the Maryland Republican Party. Meet Glynis Roxanne Kazanjian. She’s a 43-year-old Rockville resident and a Republican. But she’s not run-of-the-mill GOP rank and file. She’s a go-get-em member of the faithful! Kazanjian is one of the hardest-working GOP women in Montgomery County. 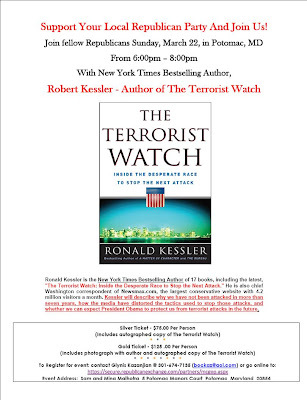 Here she is, raising money for the MoCo Republican Party with a book signing. Here she is, testifying against drivers licenses for illegal immigrants on behalf of the Maryland Federation of Republican Women. 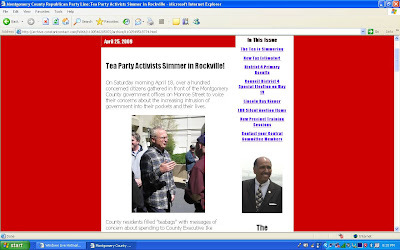 And she was the Montgomery County Coordinator for Maryland Women for McCain. But as busy as she is, Glynis Kazanjian cannot be busy enough. She wanted to do more. LOTS more. 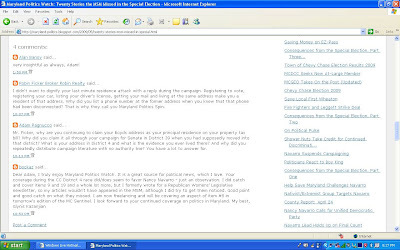 Last spring, Nancy Navarro’s County Council campaign received this email. I am a District 4 constituent and a registered Independent. There are many rumors about your citizenship, and I would like to put them to rest, to help clear my vision of who I vote for in the special election on May 19. Can you tell me if you are a US citizen and when and how you became legal? I know that you came from South America and I don't know much about immigration law. I am informally involved with a group of Independents and we are trying to identify a candidate that we feel comfortable endorsing. It would be great if you could put the rumors to rest and provide information as to when (what year) and where, which state, Ms. Navarro received her naturalization or citizenship. Thank you. 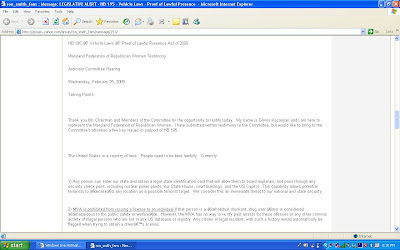 So what would a pseudonym-using, dirt-digging GOP activist do with her spare time? You guessed it – become an MSM reporter! 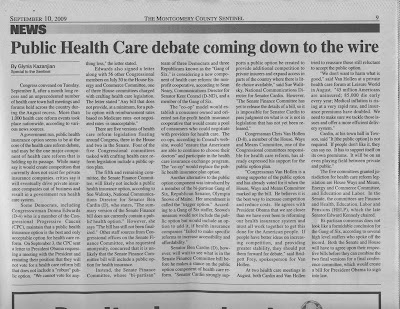 Just as Kazanjian said in her blog comment, she wrote about the District 4 campaign for the Montgomery County Sentinel. 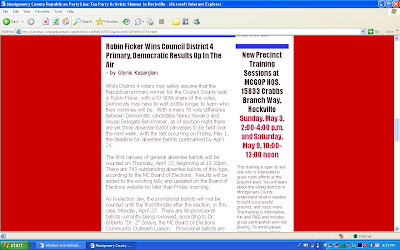 At the same time, she wrote about the campaign for the MoCo Republican newsletter. 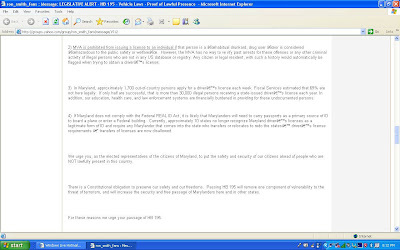 Kazanjian also covered anti-illegal immigration group Help Save Maryland for the Sentinel. She was hardly an objective observer of the group, having testified against drivers licenses for illegal immigrants for the Maryland Federation of Republican Women. 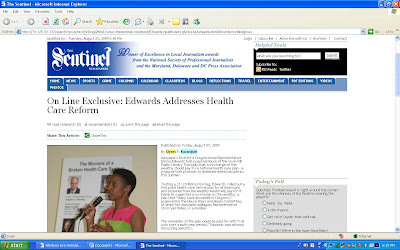 On 8/7/09, Kazanjian wrote an article for the Sentinel on Congresswoman Donna Edwards’ town hall meeting on health care. 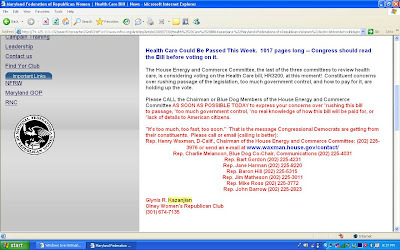 Then Kazanjian wrote an analysis on health care for the Sentinel on 9/10/09. So let’s see. 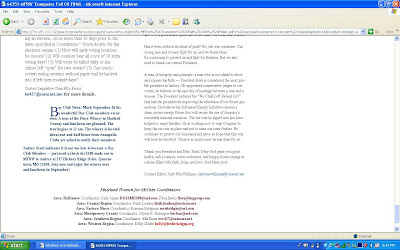 The Sentinel allows Kazanjian to write political propaganda for the GOP and write “news” articles for them on the same issues at the same time. All across America, bundles of fish wrap are protesting that the Sentinel is giving them a bad name! How Far Will Baltimore’s Corruption Scandal Go? 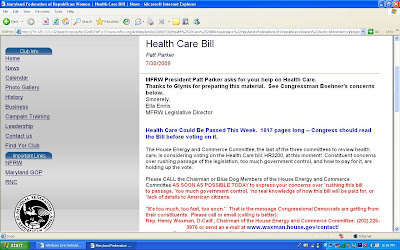 Was This a Legal Robocall?